Rhythmic gymnastics in Canada simply wouldn't exist if it weren't for the efforts of Evelyn Koop. Known as "The Godmother" of the sport in Canada, Evelyn is recognized as being the one who actually brought the sport to North America and fostered its growth nationwide. EVELYN KOOP AND KALEV ESTIENNE RHYTHMIC GYMNASTICS CENTRES. Evelyn Koop founded Kalev Estienne Rhythmic Gymnastics Centres and has been working hard ever since to build its legacy as one of Canada's most prominent Rhythmic Gymnastics Centres. Having taught Rhythmic Gymnastics at the University of Toronto, McMaster University, McGill University, she is considered a foremost authority on the sport. She has also written books about the sport itself, has created instruction manuals on how to judge it, and has even developed technical manuscripts, by-laws, and constitutions around it. 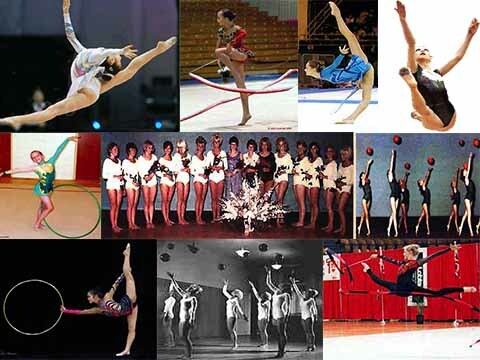 Starting in 1960’s Evelyn Koop taught Physical Education courses in Rhythmic Gymnastics through various courses, seminars and programs at: University of Toronto, McMaster University, McGill University, WEstern Univercity, Simon Fraser University, Washington State University and more. With the help of colleagues Koop founded Ontario Rhythmics Federation (May 10, 1968). By 1974 Ontario Federation had approximately 3000 members and the national federation over 4000 members. Koop continued to serve both federations as a President until 1980 when she became Executive Director for Ontario Rhythmic Gymnastic Federation. In 1975, Koop began to organize the first international competition to be hosted in Canada. She also founded the World's Best Championship, which was held in 1975. Kalev with Evelyn Koop also hosted the first event under the name “Four Continent Championships” in Toronto in 1978. In recognition of her work to the advanced sport in China And her influence in the development of the rhythmic gymnastic discipline in the USA , Evelyn Koop was awarded the FIG Medal for Achievement in 1978. Kalev performed at a celebration of the 100th anniversary of Federation International de Gymnastique (FIG) in Montreux (SUI). The second significant event for Kalev Estienne that year was a performance by the Senior Elite at the Tallinn Estonian Festival in Estonia. Golden performances by the Kalev Juniors garnered the team Gold at the Ontario Provincial Championships and the Coast to Coast games in 1989. The Junior team returned from Saskatoon that year with Silver at the Canadian National Championships. Kalev Estienne was in the spirit of sharing as much as it was receiving in 1991. Evelyn Koop devoted enormous effort into creating “The world’s Best” an international invitational competition to be hosted in Toronto every decade. Kalev Estienne hosted their firth Koop Cup in 2001. The international Invitational was hosted at Toronto’s Metro Convention Centre. 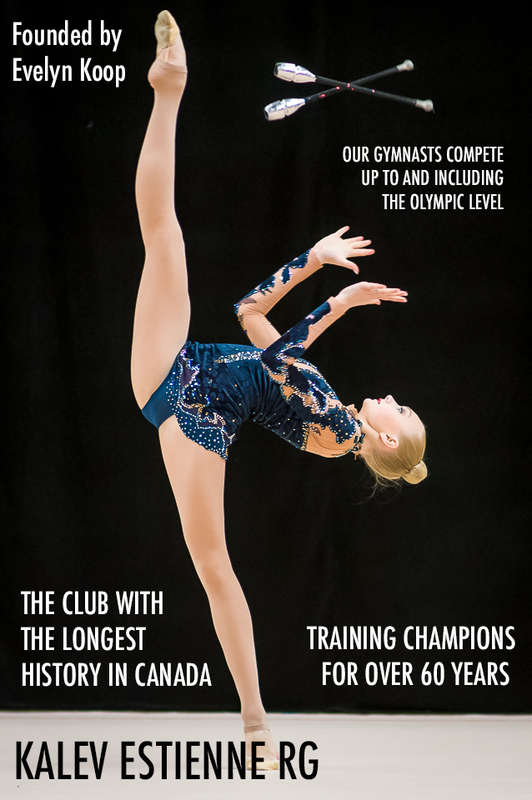 This edition celebrates 50 years of Rhythmic Gymnastic in Canada and the Toronto Estonian Kalev Sports club which fostered the creation of Kalev Estienne. In Graz, Koop and leaders of 12 others delegations came together to sign the agreement formally creating the Federation Aesthetic Group Gymnastics (IFAGG). Koop and her local peers came together again and at the end of 2003 to form the Ontario Federation for Aesthetic Group Gymnastics. Kalev with Evelyn Koop hosted the AGG World Championships in 2008 in Toronto. Kalev Estienne and the Ritmika Club jointly hosted the Elite Canada Meet in Toronto in 2010 and their Senior and Junior troupes finishes with Golds. Evelyn Koop also founded the Four Continents Championships for RG - the first held in Brazil. Dave Sandford, Chief Executive Officer of Gymnastics Ontario congratulates Evelyn Koop on being the recipient of the Dr.Gene Sutton Award. At the 50th Anniversary of Gymnastics Ontario Awards Banquet Evelyn Koop received the Dr. Gene Sutton Special Achievement Award. Well, it just so happens that in 2006, Rhythmic became part of the GCG Awards Gala & there I was honoring Evelyn Koop with the inaugural RG Program Award, named of course after her. She received her Diamond Pin that year & in 2013 she became a GCG Life Member recognizing her long time and I mean “long time” service to the Federation. So here I am privileged once again to recognize this distinguishing, extravagant woman. Rhythmic Gymnastics in Canada simply would not be if it were not for the efforts of Evelyn Koop, known by many as the “godmother” of RG. You just need to look at the Kalev Estienne website and you will find 65 years of highlights from bringing the sport of RG to Canada, developing World & Olympic gymnasts to hosting Provincial, National and International Events. Evelyn Koop, the founder & President of Kalev Estienne, has been involved as a gymnast, coach, performer, choreographer, educator, author, administrator, judge, event manager and most importantly …remains as one of the major promoters of Rhythmic Gymnastics in Canada and volunteer extraordinaire! There is so much information to share with you about Evelyn but unfortunately 65 years is a challenge to culminate in a few minutes so I will do my best to provide the highlights. In her early years, Evelyn taught Physical Education courses in Rhythmic Gymnastics at the Universities of Toronto, McMaster & McGill. She authored books “Basic Rhythmics” and “Judging”, developed Technical Manuals, By-laws, and Constitutions. She has trained many teachers and coaches and created awareness of RG through endless touring with her gymnasts throughout Canada and the United States. I was fortunate as a young artistic gymnast to have Evelyn come to our club to assist with upper body movement for beam & floor. In 1968, Evelyn along with a few others formed the Modern Gymnastics Federation and later the Canadian Rhythmic Sportive Gymnastics Federation. 1971 was the year Evelyn received international standing as a judge and was awarded a Brevet 2. She was also a member of the FIG RG Technical Committee. From 1976 to 1980, and in 1998 she was awarded the FIG Honorary Diploma “in recognition of her long –term distinguished service as an International Judge atthe World Level”. 1976 proved to be a busy year. Evelyn was the lead choreographer for the opening Ceremonies of the 1976 Olympic Games in Montreal. Evelyn worked hand in hand with Juri Titov, President of FIG and others to get RG accepted as an Olympic Sport. 1976 was also the year she initiated “The Maple Leaf” International Meet which was held for four consecutive years. In 1978 she created the Pan Pacific Championships, which later became the Four Continents Championships. These events were created with one main goal in mind…to give Canadian rhythmic gymnasts the opportunity to experience international competition. For the same reason, Evelyn introduced “The World’s best” International Invitational competition in 1991 which was later named by the federation as “Koop Cup” in Evelyn’s honour. Evelyn has recruited many world-renowned coaches & judges which helped spearhead the development of RG in Canada. Tamara Bompa, originally from Romania and brought over as a coach, judged for Canada at six Olympic Games. Liliana Dimitrova from Bulgaria took gymnasts to 3 Olympic Games & more recently Janika Moelder from Estonia. RG became an official sport at the Olympic Games in 1984. BC gymnast Lori Fung, a former member of Kalev was crowned the Olympic Champion. The second gymnast, Adrienne Dunnet was also from Kalev. Representing Kalev at the 1996 Olympics was Camille Martins and in 2000 Emilie Livingston. As you can see Evelyn was responsible for producing a lot of firsts. In 2010, it was the Kalev Junior Group that represented the America’s at the first Youth Olympic Games and captured the Bronze medal. The group became part of the Olympic Games in 1996. The Senior group from Kalev made history qualifying Canada to their first Olympic Games in London 2012. One first that Evelyn may not want me to mention but I will – Evelyn was the first National judge to arrive at Elite Ontario one year wearing two different shoes. Different colours & different heal heights. Evelyn – I checked your shoes tonight and you are good to go! Last year, Evelyn Koop President & Program Director of Kalev Estienne celebrated their 65th anniversary promoting Rhythmic Gymnastics in Canada & her club. Kalev continues to host Provincial, National & International Events. This year alone, Kalev under the management of Evelyn Koop hosted Slonny Cup international invitational, Elite Canada & the famous Koop Cup FIG event. She even gets the Mayor of Markham to come out to these events to help present awards. Evelyn has always been passionate about growing the sport so that all Canadians can participate and learn about the beautiful sport of Rhythmic Gymnastics. Evelyn deserves recognition for her continuous commitment and energy in exposing Canadian gymnasts to International Competition in Canada. Many of her former gymnasts are still with her as coaches, in her performance groups, as staff or return as dedicated volunteers that assist with the hosting of her successful events. I know that Gene will be smiling down and giving us the thumbs up with her approval just as we are! Congratulations Evelyn on receiving the Dr. Gene Sutton Memorial Award. - Was the subject of an article in the Montreal Star: "How to keep fit"
- Performed at International Caravan, at Metro Caravan, at Grey Cup (Ottawa), at Baltic Federation, in Sault Ste. Marie, In Ottawa for the Governor General, for the Board of Trade conference and the CNE Grandstand. - Kalev 's Susanne Mihkelson, Connie Lindenberger and Melanie Ivey competed at the World Championships in Cuba, and the Senior group placed 8th - forming the first Canadian team to the RG Worlds! - Performed at Rochester, N.Y., at Caravan, at the CNE Scottish Festival, Ontario Place, the Police Games (as usual) and the Winter Games. - Canadian Weekly Magazine featured "Exercises by Kalev Estienne"
- Gave seminars in in Wallaceburg, Sudbury, Sault St. Marie, Ottawa and Collingwood. - Evelyn Koop published the book: "Basic Modern Rhythmic Gymnastics"
- She received the Air Canada Sports Executive of the Year Award. - Kalev 's Senior Group won gold at the Nationals. - Jana Lazor, Senior National Champion, 3rd time! - Participated at Four Continents Championships, in Brazil, and at ESTO in Stockholm. - The Junior group were the National Champions. - The Junior group became the National Champions once again. - Evelyn Koop received the Governor General's award. - Performed for the Chinese Sports Minister at the Sheraton Centre, and participated in the Expo '86 opening ceremonies at both the Ontario and Canada Pavillions. - Performed at the CNE. - Kalev 's Junior Group won gold at the Winter Games, the Provincials, the Coast-to-Coast AND at the Nationals. - Nicole Dervourst, became the Junior NationalChampion. - Vanessa Hii, was the Novice Champion. - The Senior Elite performed at the opening ceremonies for the Special Olympics and at the World Gymnaestrada in Herning, Denmark; and Toronto City Hall for the Olympic Torch Celebrations. - Kalev 'sSenior Group won gold at the Nationals. - The Senior Elite performed at the Lion's telethon for Seeing Eye Dogs; Beauty pageants for Miss Toronto and Miss Teen Mississauga; the National Gymnaestrada in Winnipeg; Metro Police Games at the CNE; International Women's Show at the Metro Convention Centre; Canada Day at City Hall; half-time show at Blizzard's soccer game at Varsity arena, at Ontario Place, and the opening ceremonies for the SPORT Exhibit at the Ontario Science Centre. - They also traveled to Australia and performed at ESTO World Festival there. - Performed at the opening of the Special Olympics, and the Junior Elite performed at promotional shows for holding the Olympic games in Toronto and did a half-time show at an Argo's game. - The Senior Elite travelled to and performed in Hawaii. - The independent club, Rhythmic Elite Centre, was founded. - On June 16, Toronto Mayor, Art Eggleton, issued a statement that this was the" Rhythmic Gymnastics and Koop Cup Day". - Kalev also performed at Metro Drug Awareness campaign, at Canada Day celebrations at City Hall, at Caravan and at a Sports Celebrities' Auction for the benefit of the Special Olympics. Also functioned as hostesses at the Blood Donor Clinic. - The Children's Elite took part in a Danish Gymnaestrada and entertained at the banquet. Also at the kick off of Leukemia Awareness Month. - A group of six Kalev gymnasts visited Cape Town, South Africa, where they competed and performed. - Kalev Sportive 's Novice Group won silver at the Group Nationals. - One elite group participated in the 11th World Gymnaestrada in Sweden and was chosen as the Canadian representative at the FIG Gala. - Kalev gymnasts performed at the ESTO 2000 "Festival of Lights" at MacMillan Theatre and at the Molson Amphitheatre. Producer for the events was Evelyn Koop. - Emilie Livingston placed 18th at the Olympics. - Kalev Sportive 's Junior Group were the National Champions. - At the Nationals, Kalev qualified as Canada's best club to represent the country at the Aeon Cup, Japan. - Koop Cup 2001 was held, and the 50th anniversary of RG in Canada and of Evelyn Koop and Kalev was celebrated at the Metro Convention Centre. CBC broadcast a 90 minute program from the event. - One group competed at the second World Championships in Aesthetic Gymnastics and placed 13th, best of all non-European countries. - Kalev gymnasts performed at Parliament Hill, Ottawa, on July 1. - Two Kalev gymnasts (Irina Funtikova and Emilie Livingston) represented Canada at the World Championship in Madrid, Spain. - Irina Funtikova and the Kalev Junior Group represented Canada at the Four Continents' Championship in Brazil. Canada won the team competition. - Emilie Livingston and Irina Funtikova performed at the Sony International Convention in Toronto. - Kalev gymnasts performed at the Baltic States Independence Day celebrations, at Markham Sports Day, at Junior Board of Trade, at the National Gymnaestrada in New Brunswick and at the Avon Convention. - Kalev's (and Canada's) top AGG group, Rhythmic Expressions, competed at the third World Championships in Aesthetic Gymnastics in Prague, Czech Republic, placing 9th. - The Expressions, Senior Elite and other Kalev gymnasts performed at the Skydome for "First Night". - The Expressions participated in the annual international competition, Miss Valentine, in Estonia, placing 7th in the finals. - They also performed at the Marriott Hotel at a "Father Daughter Dance", at the London Club, at Royal York Hotel as part of a fundraiser for the General and Western Hospitals. - The Expressions competed at the AGG World Championships in Graz, Austria and placed 9th, best of all non-European teams. - The Senior Elite and the Expressions performed at the 12th World Gymnaestrada in Lisbon, Portugal. The latter, Kalev's AGG group, also represented Canada at the FIG Gala on this occasion. (on Toronto 1 channel, starting in January 2004). - The Expressions performed at the Architectural Ball at the U of T's Hart House in November, at the Toronto Convention Centre and, in December, at the Art Gallery of Ontario and "First Night" at the Skydome on New Year's Eve. - Kalev's Novice group were the champions. - The "Expressions" taped three performances for a Variety Show in January on the Toronto 1 TV channel. - Kalev's Junior AGG team competed at Junior Tournament, Spring Breeze, Tallinn, Estonia and placed 10th. They also made the finals. - Kalev's Senior and Junior National Aesthetic Teams performed at an arts festival in April in the United States. - All of Kalev's AGG teams joined to perform at the Metro Toronto Police Games on May 2. - The Expressions performed May 24 at the Hersey Centre, Mississauga, where Evelyn Koop was a guest of honour at the National Championships and Gala in Artistic Gymnastics. - In June, the Junior Expressions performed at celebrations for the European Union. - Several of Kalev's AGG teams competed at "Red Ribbon" where the Rhythmic Expressions won gold in the International Level. - The Rhythmic Expressions competed at "AGG World Wide", Sofia, Bulgaria and placed 10th of 28 teams from 19 countries! - All Kalev performers competed at our annual AGG competition, "the Kalev Cup"
- The "Expressions" gave a 40 minute performance at an Art Show in Vancouver, B.C. - A Kalev AGG group made the finals in a Dance Competition in Toronto. - The "Expressions" competed at the 6th AGG World Championships in Denmark and placed 7th in the general competition, 8th in the finals. - The "Junior Expressions" competed at the first AGG Worlds for Juniors in the Czech Republic and reached the finals. - In February, Evelyn Koop received a presidential award, a medal from the President of Estonia, honouring her work within the sport. - At Gymnastics Canada's Annual Awards Banquet, she also received the Rhythmic Gymnastics Program Award, now renamed in her honour to "Evelyn Koop Rhythmic Gymnastics Program Award". - Kalev's Provincial Novice and Pre-Nvice groups became the champions and the National Junior and Novice groups were the National champions. - Kalev sent two teams to the Junior AGG World Championships in Estonia and one of the teams reached the finals. One Senior team competed at the AGG Worlds om Finland and at the World Cup IV, where they placed 6rh. - Performed at the Royal Canadian Mint project with Canadian Breast Cancer Foundation event on March 31, 2006. - The "Senior Expressions" competed at the AGG Worlds in May, the only Canadian team, and also at the AGG World Cup II. - Kalev's Junior, Novice and Pre-Novice groups were the National Champions. - Kalev, together with Ritmika, hosted the AGG World Championships 2008 and the Expressions competed with two teams. The A team reached the finals! - Kalev's Novice, and Junior groups became the National Champions. - Mariam Chamilova was the National Junior champions. - Expressions performed at a General Motors celebration in September, at the Bell Gala at Sick Kids' in October, both at the Toronto Convention Centre, and at a Fashion Show at the Sheraton Hotel in November. - Rhythmic Expressions and Kalev soloists performed at Estonian House at a Veterans' Day celebration, at the opening of the WuShu World Championships and at the Special Olympics Festival in Toronto. - Mariam Chamilova was the 1st ranked Junior in Canada. - Kalev's Senior, Junior and Novice groups were the National champions. The Junior group was also the Junior Pan-American champion! - Rhythmic Expressions performed at the "Dragon Ball", celebrating the Chinese New Year, at the Toronto Convention Centre. - They also performed at the Elite Canada event, hosted by Kalev. - Kalev's Junior 4 and 5 groups won Elite Canada and the National championships, as did the Senior group (which reached the finals at Thiais, France). - At the Pan-American Championships, The Senior National team, consisting mainly of Kalev gymnasts won three gold medals: for each routine plus the overall medal! Through this, they qualified for next year's Pan-American Games. And Kalev's Mariam C was the top Canadian at the event, winning a bronze medal in the Hoop final. - Kalev's Junior Group won bronze at the Youth Olympics in Singapore. - Kalev celebrated 60 years of its existence and of RG in Canada with a new edition of the Koop Cup. Competition and Gala took place at the John Bassett Theatre of the Metro Toronto Convention Centre. - Kalev gymnasts performed at Estonian House in January. - Kalev gymnasts, Mariam Chamilova and Patricia Bezzoubenko, were given the titles of "Athlete of the Year" and "Junior Athlete of the Year" on the same occasion. - The "Rhythmic Expressions" performed at Casino Rama in March. 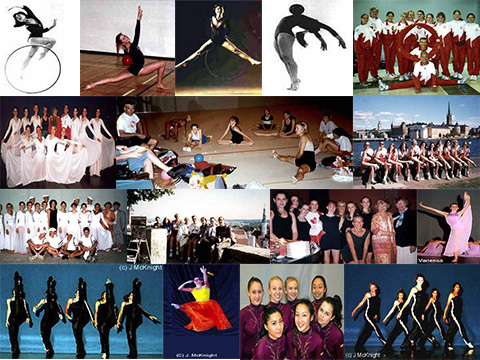 - "Canadiana" performed at a Toronto school and several of our gymnasts demonstrated RG in high-schools. - In July, members of the "Northern Lights" performed at Dundas Square. - Kalev's Senior Group, which is also the Canadian National Group, placed ahead of the groups from the US and Brazil at the Worlds and will, therefore, represent the Americas at the Olympics in London next year. - In October, Senior and Junior athletes from Kalev performed at a Cooking show at the Toronto Convention Centre. - The "Northern Lights" placed 12th of 23 teams from around the world at the final Challenge Cup in Moscow in November. - Our Estonian gymnasts performed at "Christmas Around the World" at City Hall in December. - Kalev gymnasts Dora Yudeikin and Aleksandra Yurevich performed at Mount Sinai in an "Orlando Production". - The FIG draw for rhythmic gymnastics participants in the 2012 Olympics took place in February and confirmed that Kalev's Senior group will start as #2 with their ball routine on August 9 in the Wembley Arena in London, UK! - Kalev's Senior Group as well as Kalev's Junior Group were confirmed as Canada's National Groups at the Nationals, and Patricia Bezzoubenko was the Junior National Champions again. - The "Rhythmic Expressions" placed 7th in the finals of the AGG World Championships. - The Kalev Senior group, the first Canadian RG group ever to participate in the Olympic games, placed 11th at the London Olympics. - The Kalev Junior group got bronze overall and silver for their ball routine at the Junior Pan American Championships in Cordoba, Argentina. In the same competition, our Junior Patricia Bezzobenko became the Junior Pan American champion. - Kalev got the "Club of the Year" Award from Gymnastics Ontario. - Kalev's Senior, Patricia B, was 1st at Elite Canada and at the Nationals and was awarded "Athlete of the Year". - Evelyn Koop received a "Life Membership" from Gymnastics Canada and was named Honorary Member of IFAGG because "she is one of the founding members of IFAGG and has promoted AGG since she began develop the sport in Canada in the 1950s". - In June, the two senior AGG teams and the Alumnae Elite performed at the Ontario Gymnaestrada. - In July, the "Rhythmic Expressions" participated in the second "Gym for Life" Challenge in Cape Town, South Africa, and brought home a silver medal. - Kalev performed at the Estonian House at their Christmas Holiday celebration. - AGG teams performed at a Raptors' game and the Junior RG group at the convention centre in January. - May 2 - 3, Kalev hosted two international competitions: Koop Cup 2014, where the Canadian Junior group, with four Kalev gymnasts, won gold; and the very first Four Continents AGG Championships, with more than 150 athletes from around the world. Here Kalev groups won gold in all categories: Masters, Seniors, Juniors and two child levels (8-10 and 10-12 year olds). - Kalev's Patricia Bezzoubenko, became the Senior National Champions, and the Senior and Junior groups, consisting mostly of Kalev gymnasts, became the National groups. - By winning the Junior Pan-Am Games the Junior group became the Canadian representative to the Youth Olympics in China. - Kalev gymnasts performed at two pre-PanAm events in Markham in the fall. Koop Cup International was first presented in 1991, as a bi-annual event. Two decades later, we are not only celebrating 27 years of Koop Cup, along we are proudly honouring 67 years of Rhythmic Gymnastics in Canada. Rhythmic gymnastics in Canada simply would not be if it weren’t for the efforts of Evelyn Koop. Known as the “God Mother” of rhythmic gymnastics, and recognized as the one who introduced the sport to North America. In the forties and fifties, there were many ethnic groups in Toronto who started rhythmic gymnastics movements. Among them was the Kalev Sport Club, which included women’s, men’s gymnastics, folk dance, known as “Modern Gymnastics”. Founder of the Ontario and Canadian Rhythmic Gymnastics Federations in 1968, the creator of the Four Continents Championships, and the crusader behind the sport’s acceptance into the Olympics, Evelyn Koop’s story is highly accented with experiences that originate in Sweden and across the world. Trained at the Idla Institute of Physical Education in Sweden, under the direction of one of the international founders of the sport Ernst Idla, and armed with a Canadian Dance and Arts Degree. Mrs. Koop became a member of the Estonian Sports Club, Kalev, first as a gymnast, then as a coach. Out of this club, she organized the Kalev Estienne Rhythmic Gymnastics Club. The other “Modern Gymnastics” programs no longer exist, however Kalev Estienne, is marching on. Evelyn Koop has taught Physical Education courses in Rhythmic Gymnastics, previously called “Modern Gymnastics”, at the Universities of Toronto, McMaster and McGill. Mrs. Koop authored the books of “Basic Modern Rhythmic Gymnastics” and “Judging”, she developed Technical Manuals, By-Laws, and Constitutions for Rhythmic Gymnastics. Evelyn has trained nearly a thousand teachers and instructors in Ontario, and created awareness of the sport by endless touring with her gymnasts across Canada and the United States. It was a great honour for Canada when Evelyn Koop was given the task of introducing the sport to China. In May 1968, Evelyn Koop was able to form both the Provincial and the National Canadian Federations for rhythmic gymnastics and she was elected president of both Federations, remaining in that position until 1980. Evelyn Koop initiated the “The Maple Leaf” international meet in 1976, which was held four consecutive years. In 1978 she created the Pan-Pacific Championships, which later transitioned into the Four Continents Championships. During this competition in 1997, Kalev’s Emilie Livingston won silver overall (2 gold, 1 silver and 1 bronze, and the only Canadian with an overall medal). This event was created to give Canadians an opportunity to achieve higher honours than possible at the World Championships. In 1991 “The World’s Best” international invitational competition was created, where Evelyn Koop was honoured by the Canadian Gymnastics Federation, naming the competition “Koop Cup”. Evelyn Koop was the choreographer for the opening ceremonies of the 1976 Olympic Games, demonstrating rhythmic gymnastics, which opened the doors for the sport to be a part of the Olympic Games. The first Olympic competition, in 1984, was won by a former Kalev athlete, Lori Fung. Evelyn Koop has had the honour of being selected as a world level judge, attending many international competitions, including the 1996 Olympic Games in Atlanta. Evelyn was honoured to send Camille Martens from Kalev, as Canada’s only competitor in rhythmic gymnastics at the 1996 Games. In 2000, Kalev’s Emilie Livingston represented all of the Americas at the Olympic Games in Sydney! Kalev Estienne is now the umbrella organization for eight different rhythmic gymnastics clubs. 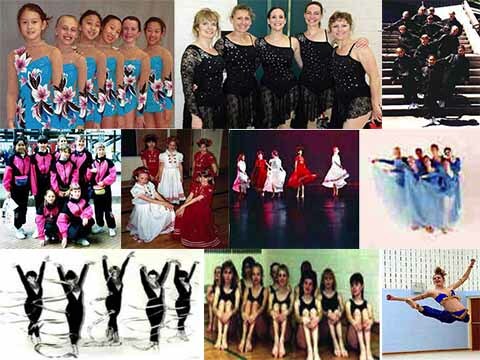 One of the most recent is the “Kalev AGG Academy”, which began in 1995 as a rhythmic dance company. When Evelyn Koop realized an old dream: to create a company that could lift the sport to levels where it would be recognized as one of the most ihe mpressive of t performing arts. It would also mean returning to the roots of the sport: the rhythmic group performance, now called aesthetic gymnastics. Kalev has the most successful AGG teams in Canada. Evelyn Koop will continue to expand and develop her beloved rhythmic gymnastics in ever-new directions.